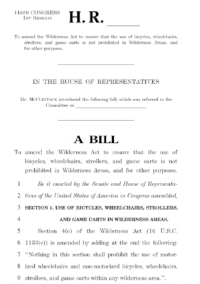 When the President of the United States signed the Wilderness Act of 1964 he wasn't banning bicycles, wheelbarrows, and strollers. The Wilderness Act of 1964 was a beautiful thing. It protected our most precious lands and celebrated the recreational opportunities they would provide for generations to come. The Act made it clear that things with engines were bad, and living power sources like humans and horses were good. The Act didn’t ban bikes; that happened twenty years later. The Sustainable Trails Coalition is a nonprofit working to reverse the ban on bicycles in Wilderness areas. However, just as we’re opposed to the blanket ban, we’re also opposed to a blanket permit. We ultimately believe the trails in our Wilderness areas need a big dose of cooperation, common sense, and repair; living power sources like hikers, cyclists, equestrians, cross country skiers, snowshoers, etc., need to get along, work together, and partner with land managers to decide what is in the best interest of each trail. Reversing the ban ≠ an open permit. Just as we're opposed to a blanket ban on bikes in wilderness areas, we're also opposed to a blanket permit. Under existing rules, land managers have wide discretion and authority to restrict certain activities from certain areas at certain times. So just as there are rules one where one can camp, when and where campfires are allowed, and where you can ride your horse, local land managers can allow, or restrict, cyclists as appropriate. The bills we hope to see passed simply eliminate the blanket ban and return authority to the local land managers. "Mechanical transport, as herein used, shall include any contrivance which travels over ground, snow, or water, on wheels, tracks, skids, or by floatation and is propelled by a nonliving power source contained or carried on or within the device." Clearly bikes were originally allowed, and should never have been banned. Please help us reverse this ban.